The cool air is here, the leaves are starting to change, apple and spice something is baking all over town and most importantly, it is wine season for me. I love wine and as the nights get chilly nothing warms me like a nice glass of red, while eating warm from the oven apple crisp…. 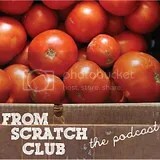 With the holidays right around the corner, we thought we’d bring you a special storytelling episode of the From Scratch Club podcast. We talked with a few of our blog readers, podcast listeners, FSC Swappers and other friends and asked them to share holiday tales from their kitchen. The good, the bad & the ugly….